From the moment I opened this book, I was under a spell. And remained so until the very last page. Isabel Allende’s words are bewitching and I am thankful that I was on holiday when I started, so I could have hours of uninterrupted, beach-reading bliss! Throughout Isabel Allende’s magical historical novel about the conquest of Chile, I went through every emotion imaginable. The enthralling book tells of the exciting life of Inés de Suárez, the mistress of Pedro de Valdivia, who became the first royal governor of Chile. Inés’ life wasn’t always so interesting. After her first husband leaves to travel to The New World in the Americas, in search of gold and glory, Inés becomes frustrated with her boring life in Plasencia, Spain. She makes a decision that will change the course of her life, and history. She decides to follow her husband, not for love, but for herself. She longs for freedom and adventure. She reaches Peru, after a long and difficult journey, only to learn that her husband has died and that she is now a widow, alone in an unknown country. Being a resourceful and determined woman, Inés manages to survive and one day meets a handsome stranger – Pedro de Valdivia. Together, with a group of soldiers and servants, they travel to the unknown, to make a new life in Chile. And that is really just the beginning. 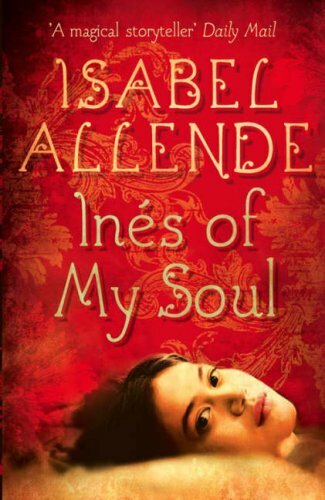 Inés of My Soul is a gripping work of historical fiction, and although history is often embellished, there are enough facts for people who have an interest in the conquest of Chile. Taking these facts, Allende pieces together an imaginative tale of passion, brutality, love and courage. She is not scared of describing the horror of war and giving details of the torture techniques often used by both Spaniards and the indigenous Mapuche in Chile. I found these parts of the book very interesting, as I do not know much about the conquest of South America. I also immensely enjoyed reading about Inés’ life. She is a very strong and passionate character, her love for her people and her new country comes across through her words beautifully. As a woman, it is easy to relate to Inés and as you read about her achievements, you can not help but admire her. Buy the book and become hooked by clicking on the picture below! Yeah, it was a really good read, perfect for sitting on the beach! It’s the first book I’ve read by her, I’m looking forward to reading more! Wow…You loved the book that much? What a ringing endorsement! I haven’t read this one yet, but now I want to. Isabel Allende is a fantastic writer, and I haven’t read a book by her that I haven’t loved.